Director Jean de Rovera’s film emits a distinct fairytale vibe to a contemporary viewer’s eyes given how it presents more primitive versions of these various sports we have been accustomed to over the years through a silent-era aesthetic. Figure skaters, keeping their skates on the ice, forgoing all those lutzes and salchows we are accustomed to in the here and now, are dressed like weekenders on the pond; hockey is played on an outdoor rink with no padded walls; bobsledders are more like tobogganers rocking back and forth to generate forward momentum as they go sledding down a souped-up hill; ski jumpers don’t fly through the air so much as flail. Even the opening ceremonies are just a parade, and not into some mammoth stadium destined to be an empty blight on the community but along a snowy trail and past a small crowd. It’s quaint, even thrifty. Indeed, the 1924 Winter Games lasted 12 days, less than two weeks, which feels like a blip compared to the most recent version in Pyeonchang which actually kicked off competition a couple days before the opening ceremonies, stretching the whole thing out to nearly three weeks. As such, even if the documentary’s scant 38 minute running time leaves you wishing for a little more footage, it also feels just right, not overstaying its welcome and wearing you out. “The Olympic Games Held at Chamonix in 1924” underscores this by not focusing on any precise narratives, just letting the footage speak for itself, reveling in the feats of strength, and reveling sometimes in slow motion that comes across as breathless as any modern footage, an evocative reminder that athletes of any era are a sight to behold. 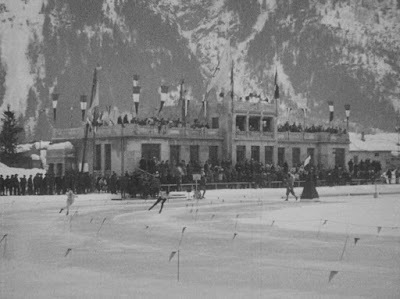 “The Olympic Games Held at Chamonix in 1924” is markedly different from Bud Greenspan’s “16 Days of Glory” films, which he did for L.A. in 1984, Calgary in 1988, and Lillehammer in 1994, among others, which were lengthy presentations that explicitly and lengthily focused on individual athletes and their respective competitive battles told in self-serious tones. That’s not a bad thing. I get a kick out of the Olympics taking themselves incredibly seriously, at least on the playing field, a la the nigh comically operatic 1976 Winter Olympic film “White Rock.” But there is something to be said for the lickety split approach of de Rova too, who reminds us that the Olympics really are just games. The closest the movie gets to recounting any individual stories is simply placing an athlete, or a team, on the camera with an intertitle proclaiming who they are and what they have won. The expressions on the athletes faces often exude a kind of bemused incredulity, as if they can’t even fathom what all the fuss is about.